I should receive the pad in a few days so I will definitely try it out at home a few times, and then I have plans to be in the Smokies again in a few weekends and I will get 2 outdoor nights on it then. So, I will be sure to report back with an initial review as well as on how this pad performs in the field. UPDATE: I have uploaded a complete review of the NeoAir on the Backpackgeartest site. The review can be read by clicking here. One thing I can say about the NeoAir is that it usually stirs up conversations. Many seem to hate them while others seem to love them, then of course there are those few that simply like them. After owning mine for the last year, I have fallen into the love them crowd! To the point that it will be replaced if ever need be by another one (especially since I bought mine from REI… 🙂 ). “I gotta give my love for the NeoAir, cause I do, a lot! It was one of the very best purchases I made last year, and I will do it again if need be. I have had no issues with crinkly noise, nor has anybody else that has been hiking with me, or any of the other hikers that I bunked with in the shelters. My thoughts on durability: It’s an air pad. I take that into consideration when I use it. I try to clear the area of sharp pointy things, same as I do with ANY air pad. However, they do make a repair kit for it if something were to happen, just like they do for the rest of them (and it is in my kit)…If I need to carelessly throw my pad on the ground and plop down on it, I will use a ccf pad. Otherwise, I have no reason to cry about how the air pad wasn’t durable enough since I didn’t treat it the way it is supposed to be treated, same as with any other air pad. R-Value. It is listed at 2.5. What does that mean to me? Well, I don’t know. What I do know is that I can use my NeoAir with a 1/8″ Thinlight pad and be fine to right around single digits. If I want to go out in colder temps, I will use a 1/4″ pad, maybe even with the 1/8″ pad if needed. As well, I appreciate that the bottom of the NeoAir is tacky feeling. That means it slides around less in my tents (especially those with sil floors) than my other pads. It takes me approximately 18 breaths to inflate, so no big deal (for me). Deflating it is even easier, just unscrew the valve while I am laying on it in the morning, just before I get up. About 15 – 20 seconds later it is almost flat. Also, the insulation is really only a mylar sheet. So, I don’t have to worry about long-term deterioration of a synthetic or down insulation inside the pad. As well, I don’t have to worry about the moisture from my breath damaging that insulation. I can say some bad things about the pad though. It didn’t come with a stuff sack (which means I can save half an oz by using a rubber band, if I choose). It also didn’t come with a repair kit. That one was the real bummer. A repair kit is essential to have with ANY air pad. So, I had to look around to get the appropriate repair kit. It cost me $10 (I think). During the summer, I have to take more care with it as far as leaving it inflated. In the heat, the air will expand and if the NeoAir is left inflated it will ruin the internal baffles by blowing them apart. 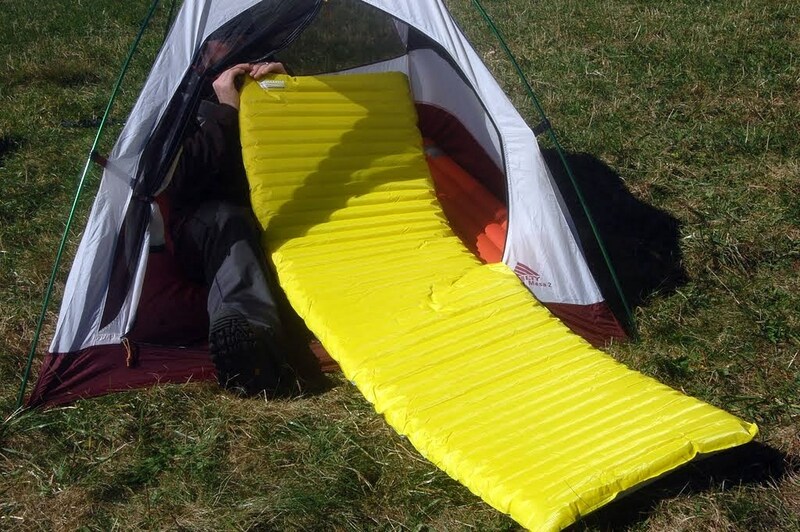 So, if I am base camping, I have to remember not to leave the pad inflated during the day. However, during the day I am usually hiking to my next destination anyway. So, I hope that this helps to answer anyone’s (potential) questions. I would like to make one thing clear though. I am not trying to push the NeoAir as being the “best” air pad out there. However, I do feel like it is the “best” for me. Everyone has different issues, concerns and needs and we are all built different so we experience life (and everything within it) a little different than the next. 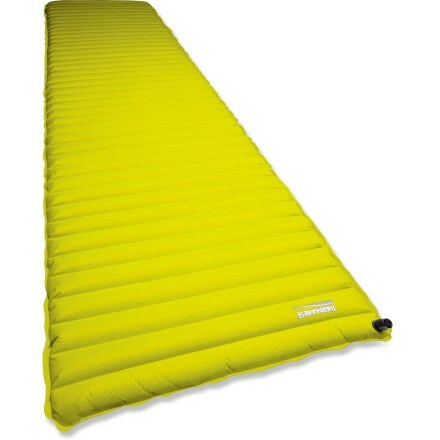 How would you rate this in comparison to Gossamer Gear’s new air only pad?